Virtual reality in the past? A lot changed in our lives since the advent of the personal computer about 40 years ago. There is computertechnology all around us, creating virtual worlds everywhere we look. Virtual worlds revolutionize medicine, the military and the entertainment industry. Virtual reality has become standard everywhere you look. The devices are getting smaller and more capable. The size of the devices are only getting limited by our eyes, ears and the other senses. The newest incarnation of virtual reality is Google Glass, a wearable personal monitor with internet connection. But the military is using the technology for years to control drones and other devices. – Due to close proximity to the user's eyes the simulated screen size of the device is much larger. – By using the device in in front of both eyes, true 3D can be displayed, which is essential for real world simulations. 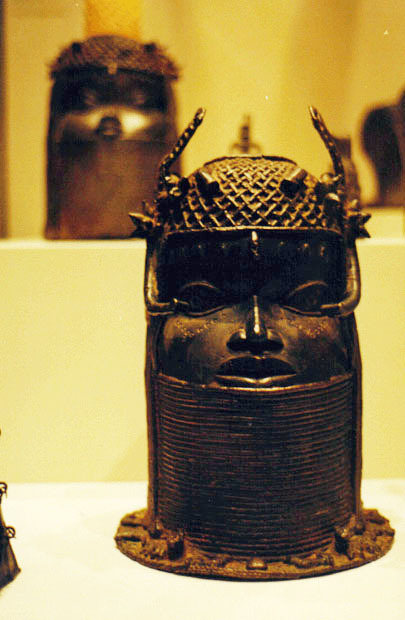 Every since I'm interested in the PaleoSeti Theory, I'm interested in depictions of unusal helmets and face masks from anient times. Some of those depictions are eerely similar to modern virtual reality devices. Coincidence? Just another case of "looks like...". I don't think so. Depictions of virtual reality devices - again a worldwide phenomenon - fits perfectly into the picture if we assume an extraterrestrial contact in the past. This very unusual helmet depiction is orginally from Africa (now in the Metropolitan Museum of Art in New York). Look at the two devices extending in front of the eyes. In my opinion this is misunderstood Virtual Reality technology of a Cargo Cult (See FAQ page, question 19)This personal monitor system would enable the wearer to see 3D images as mentioned above. the modern counterpart of such a "personal Monitor System". Photo 3 I took in Chichen Itza, Mexiko. 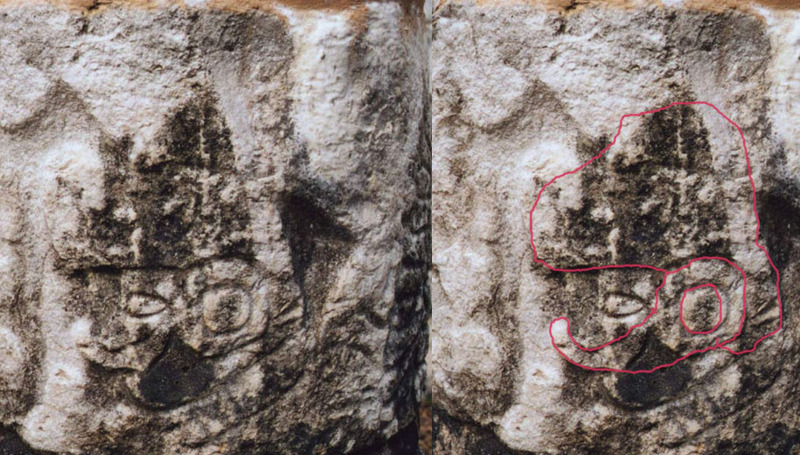 Again the same high-tech Technology, misunderstood by the Maya, but accurately portrayed in stone, thousands of years ago! Please click on the image to get a larger view. You can clearly see the the face, the helmet and the monitor. Please compare Photo 4, a modern device. The technology used is almost identical! To me it is amazing how close our technology looks to what the ancient Maya saw. Photo 5shows a virtual reality helmet used by the US army. 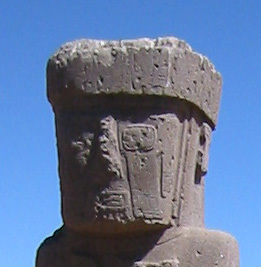 Photo 6 I took in Tiahuanaco, Bolivia and shows the Ponce Monolith. 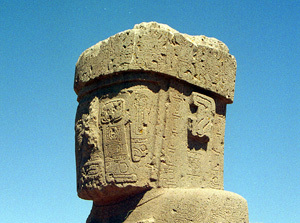 This carving also has a technical apparatus in front of its left eye which is connected to the rest of the helmet. Look at the eye itself, it's square, like a monitor (photo 2). Again this garving is several thousand years old. 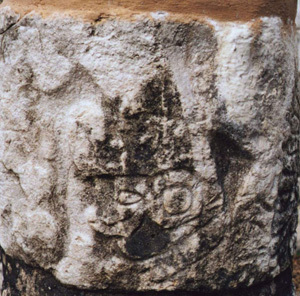 The carving style is different to the Maya of course, but I think they both show similar technology.